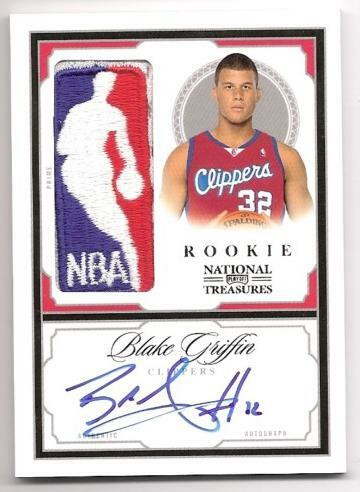 Blake Griffin Rookie Card! Cheap! The Blake Show. I love Blake Griffin. The Clippers are lucky to have him. They can almost hold their heads high at Staples Center again. Again? I digress. Kid just takes dunking and passion on the court to a whole new level. (the rhythm is the bass, and the bass is the treble) I also love sports cards. 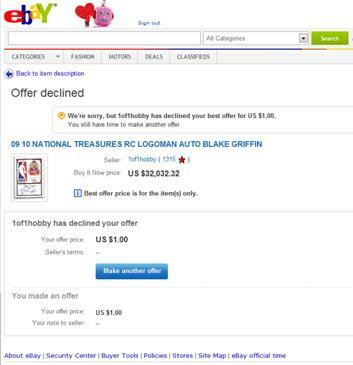 So, when I saw, via Twitter, this one of a kind Blake Griffin rookie card on eBay (thanks @DarrenRovell & @PaniniAmerica), I just had to have it. It was offered for only $32,032.32. A steal, right? And see the price? get it? get it? his number is 32! Cheap and clever! Shockingly, there’s also a “Make Offer” option for this card. WHAT?! I could get it for less than 32 grand? This card is as good as mine. This entry was posted in Basketball, NBA and tagged Blake Griffin, Clippers, eBay, Los Angeles, NBA, Rookie, Staples Center, The Blake Show. Bookmark the permalink.